Ariel Rios Federal Building, Washington, D.C. The Bureau of Alcohol, Tobacco, Firearms and Explosives (ATF) is a federal law enforcement organization within the United States Department of Justice. Its responsibilities include the investigation and prevention of federal offenses involving the unlawful use, manufacture, and possession of firearms and explosives; acts of arson and bombings; and illegal trafficking and tax evasion of alcohol and tobacco products. The ATF also regulates via licensing the sale, possession, and transportation of firearms, ammunition, and explosives in interstate commerce. Many of the ATF's activities are carried out in conjunction with task forces made up of state and local law enforcement officers, such as Project Safe Neighborhoods. The ATF operates a unique fire research laboratory in Beltsville, Maryland, where full-scale mock-ups of criminal arson can be reconstructed. The agency is led by Thomas E. Brandon, Acting Director, and Ronald B. Turk, Acting Deputy Director. The ATF has 4,770 employees, and an annual budget of $1.15 billion (2012). The seal of the ATF when it was a part of the U.S. Treasury Department. The flag of the ATF when it was a part of the U.S. Treasury Department. The ATF was formerly part of the United States Department of the Treasury, having been formed in 1886 as the "Revenue Laboratory" within the Treasury Department's Bureau of Internal Revenue. The history of ATF can be subsequently traced to the time of the revenuers or "revenoors" and the Bureau of Prohibition, which was formed as a unit of the Bureau of Internal Revenue in 1920. It was made an independent agency within the Treasury Department in 1927, was transferred to the Justice Department in 1930, and became, briefly, a division of the FBI in 1933. When the Volstead Act, which established Prohibition in the United States, was repealed in December 1933, the Unit was transferred from the Department of Justice back to the Department of the Treasury, where it became the Alcohol Tax Unit (ATU) of the Bureau of Internal Revenue. Special Agent Eliot Ness and several members of The "Untouchables", who had worked for the Prohibition Bureau while the Volstead Act was still in force, were transferred to the ATU. In 1942, responsibility for enforcing federal firearms laws was given to the ATU. In the early 1950s, the Bureau of Internal Revenue was renamed "Internal Revenue Service" (IRS), and the ATU was given the additional responsibility of enforcing federal tobacco tax laws. At this time, the name of the ATU was changed to the Alcohol and Tobacco Tax Division (ATTD). In 1968, with the passage of the Gun Control Act, the agency changed its name again, this time to the Alcohol, Tobacco, and Firearms Division of the IRS and first began to be referred to by the initials "ATF". In Title XI of the Organized Crime Control Act of 1970, Congress enacted the Explosives Control Act, 18 U.S.C.A. Chapter 40, which provided for close regulation of the explosives industry and designated certain arsons and bombings as federal crimes. The Secretary of the Treasury was made responsible for administering the regulatory aspects of the new law, and was given jurisdiction over criminal violations relating to the regulatory controls. These responsibilities were delegated to the ATF division of the IRS. The Secretary and the Attorney General were given concurrent jurisdiction over arson and bombing offenses. Pub.L. 91-452, 84 Stat. 922, October 15, 1970. In 1972 ATF was officially established as an independent bureau within the Treasury Department on July 1, 1972, this transferred the responsibilities of the ATF division of the IRS to the new Bureau of Alcohol, Tobacco, and Firearms. Rex D. Davis oversaw the transition, becoming the bureau's first director, having headed the division since 1970. During his tenure, Davis shepherded the organization into a new era where federal firearms and explosives laws addressing violent crime became the primary mission of the agency. However, taxation and other alcohol issues remained priorities as ATF collected billions of dollars in alcohol and tobacco taxes, and undertook major revisions of the federal wine labeling regulations relating to use of appellations of origin and varietal designations on wine labels. In the wake of the terrorist attack on the World Trade Center and the Pentagon on September 11, 2001, President George W. Bush signed into law the Homeland Security Act of 2002. In addition to the creation of the Department of Homeland Security, the law shifted ATF from the Department of the Treasury to the Department of Justice. The agency's name was changed to Bureau of Alcohol, Tobacco, Firearms, and Explosives. However, the agency still was referred to as the "ATF" for all purposes. Additionally, the task of collection of federal tax revenue derived from the production of tobacco and alcohol products and the regulatory function related to protecting the public in issues related to the production of alcohol, previously handled by the Bureau of Internal Revenue as well as by ATF, was transferred to the newly established Alcohol and Tobacco Tax and Trade Bureau (TTB), which remained within the Treasury Department. These changes took effect January 24, 2003. The Subcommittee received evidence that ATF primarily devoted its firearms enforcement efforts to the apprehension, upon technical malum prohibitum charges, of individuals who lack all criminal intent and knowledge. Evidence received demonstrated that ATF agents tended to concentrate upon collector's items rather than "criminal street guns". In hearings before ATF's Appropriations Subcommittee, however, testimony was submitted estimating that 75 percent of ATF gun prosecutions were aimed at ordinary citizens with no criminal intent. The Firearm Owners Protection Act of 1986 addressed some of the abuses noted in the 1982 Senate Judiciary Subcommittee report. Two incidents in the early 1990s—Ruby Ridge and the Waco Siege—involved the ATF and later the Federal Bureau of Investigation's Hostage Rescue Team (HRT). Both brought criticism to the ATF and FBI. The Ruby Ridge Siege began in June 1990. Randy Weaver was pressured by Kenneth Fadeley, an ATF informant, to shorten the barrels on two shotguns and sell these to Fadeley. Weaver maintained the barrels were a legal length, but after Fadeley took possession, the shotguns were later found to be shorter than allowed by federal law, requiring registration as a short-barreled shotgun and payment of a $200 tax. ATF filed firearms charges against Weaver, but offered to drop the charges if he would become an informant. After Weaver refused to cooperate, ATF passed on false information about Weaver to other agencies that became part of a misleading file that profiled Weaver as having explosive booby traps, tunnels and bunkers at his home; growing marijuana; having felony convictions; and being a bank robber. (At his later trial, the gun charges were determined to be entrapment and Weaver was acquitted.) However, Weaver missed a February 20, 1991, court date because U.S. Probation Officer Richins mistakenly told Weaver that the trial date was March 20, and the US Marshals Service (USMS) was charged with bringing Weaver in. Weaver remained with his family in their mountain top cabin. On August 21, 1992, a USMS surveillance team was fired up, resulting in a shootout that killed US Marshal Bill Degan, Samuel Weaver and Weaver's pet dog. FBI HRT surrounded the cabin. The next day, Lon Horiuchi (an FBI HRT sniper) fired at Weaver, missing and killing Weaver's wife. A subsequent Department of Justice review and a Congressional hearing raised several questions about the actions of ATF, USMS, USAO and FBI HRT and the mishandling of intelligence at the USMS and FBI headquarters. The Ruby Ridge incident has become a lightning rod for legal activists within the gun rights community. The second incident was the Waco Siege of the Branch Davidian religious sect near Waco, Texas, on February 28, 1993. ATF agents, accompanied by the press, conducted a raid to execute a federal search warrant on the sect's compound, known as Mt. Carmel. The Branch Davidians were alerted to the upcoming warrant execution but ATF raid leaders pressed on, despite knowing the advantage of surprise was lost. (ATF Director Steve Higgins had promised Treasury Under Secretary for Enforcement Ron Noble that the Waco raid would be canceled if the ATF undercover agent Robert Rodriguez reported that the element of surprise had been lost.) The resulting exchange of gunfire killed six Davidians and four ATF agents. FBI HRT later took over the scene and a 51-day stand-off ensued, ending on April 19, 1993, after the complex caught fire. The follow-up investigation revealed the bodies of seventy-six people including twenty children inside the compound. A grand jury found that the deaths were suicides or otherwise caused by people inside the building. Shortly after the raid, the bureau's director, Stephen E. Higgins, retired early from his position. In December 1994, two ATF supervisory agents, Phillip J. Chojnacki and Charles D. Sarabyn, who were suspended for their roles in leading the Waco raid were reinstated, with full back pay and benefits (with a demotion) despite a Treasury Department report of gross negligence. The incident was removed from their personnel files. Timothy McVeigh cited these incidents as his motivation for the Oklahoma City Bombing, which took place on April 19, 1995, exactly two years after the end of the Waco Siege. The ATF was criticized for poor planning leading to the James Beck Shootout in 2001, which resulted in the immediate deaths of a deputy sheriff as well as the suspect, and the later suicide of ATF agent Jeff Ryan. Following the attacks on September 11, 2001, the ATF expanded regulations covering fuels used in amateur rocketry, including ammonium perchlorate composite propellant (APCP). Two rocketry clubs, the National Association of Rocketry (NAR), and the Tripoli Rocketry Association (TRA), argued that APCP is not explosive and that the ATF's regulations were unreasonable. The NAR and TRA won their lawsuit against the ATF in 2009, lifting the government restrictions. The associations maintain their own restrictions, and rocketry is also regulated by the Federal Aviation Administration (FAA). 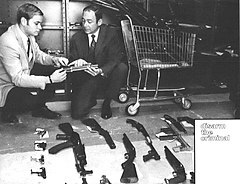 Between May 2004 and August 2005, ATF agents, in conjunction with Virginia state, county, and city police, conducted an operation at eight gun shows in the Richmond area to reduce straw purchases for criminals. :10 In a February 2006 House subcommittee hearing, the show's owner said: "People were approached and discouraged from purchasing guns. Before attempting to purchase, they were interrogated and accused of being in the business without a license, detained in police vehicles, and gun buyer's homes were visited by police, and much more. ":19 A gun salesman testified that he was singled out for harassment by two ATF agents. :28 The owner of a gun shop testified that he thought agents questioned female customers too often. He said that times had changed and more women were shopping for guns, adding: "It seems, however, to be the prevailing opinion for law enforcement at the gun show that any woman who brings a male friend for advice or support must be making a straw purchase. ":38 A private investigator said the NRA contracted her to go to Richmond to investigate dozens of complaints by NRA members of "massive law enforcement presence, residence checks, and minority buyers being followed, pulled over and their legally purchased guns seized. ":41 The purchasers were compelled by an ATF letter to appear at ATF offices to explain and justify their purchases. ATF stated this was a pilot program that ATF was planning to apply throughout the country. In Pittsburgh, Pennsylvania, ATF agents visited a gun show's customers' homes a week after the show, demanding to see the buyers' guns or sale paperwork and arresting those who could not—or would not—comply. A September 2008 report by the Justice Department's Office of the Inspector General determined that 76 firearms and 418 laptop computers were lost, stolen or missing from ATF, after a 59-month audit period between 2002 and 2007. In May 2008, William Newell, Special Agent in charge of the Phoenix ATF Office, said: "When 90 percent-plus of the firearms recovered from these violent drug cartels are from a U.S. source, we have a responsibility to do everything we can to stem the illegal flow of these firearms to these thugs." According to the Justice Department's Office of the Inspector General, "ATF told the OIG that the 90-percent figure ... could be misleading because it applied only to the small portion of Mexican crime guns that are traced." Under operations "Fast and Furious," "Too Hot to Handle," and "Wide Receiver," indictments show that the Phoenix ATF Office, over protests from the gun dealers and some ATF agents involved and without notifying Mexican authorities, facilitated the sale of over 2,500 firearms (AK-47 rifles, FN 5.7mm pistols, and .50 caliber rifles) to traffickers destined for Mexico. Many of these same guns are being recovered from crime scenes in Arizona and throughout Mexico, which is artificially inflating ATF's eTrace statistics of U.S. origin guns seized in Mexico. One gun is alleged to be the weapon used by a Mexican national to murder Customs and Border Protection Agent Brian Terry on December 14, 2010. ATF and DOJ denied all allegations. After appearing at a Congressional Hearing, three supervisors of Fast and Furious (William G. McMahon, Newell, and David Voth) were reported as being transferred and promoted by ATF. ATF denied the transfers were promotions. In June 2011, Vince Cefalu, an ATF special agent for 24 years who in December 2010 exposed ATF's Project Gunrunner scandal, was notified of his termination. Two days before the termination, Rep. Darrell Issa (R-CA), chairman of the House Committee on Oversight and Government Reform, sent a letter to the ATF warning officials not to retaliate against whistleblowers. Cefalu's dismissal followed allegations that ATF retaliates against whistleblowers. ATF spokesman Drew Wade denied that the bureau is retaliating but declined to comment about Cefalu's case. In 2015, a proposal by the ATF to prohibit sales of certain .223 cartridges was dropped following a negative response from the public and the legislature. In 2017, information was leaked about a proposal by the Deputy Director of the ATF (the number two official) to deregulate firearm sound suppressors and other 'Pro-Gun' actions to be taken, known as 'The White Papers'. These have no legal bearing at the moment. Since 2001, ATF Agents have recommended over 10,000 felons every year for federal prosecution for firearms possession through the Project Safe Neighborhoods framework. In PSN's first year, 2001–2002, over 7,700 of these cases resulted in convictions with an average sentence of over five years per defendant. This number had risen to over 12,000 prosecutions in FY 2007. The annual FBI Uniform Crime Report (UCR) demonstrated that throughout the decade of 2001–2010, the reduction of violent crime offenses in United States Districts with dedicated Project Safe Neighborhood Agents and United States Attorneys far outperformed the national average. An outgrowth of the Project Safe Neighborhoods framework was the creation of Violent Crime Impact Teams which worked proactively to identify, disrupt, arrest and prosecute the most violent criminals through innovative technology, analytical investigative resources and an integrated federal, state and local law enforcement strategy. Generally, about 90% of the cases referred by ATF for prosecution each year are for firearms, violent crime, and narcotics offenses. Through the first half of 2011, ATF (with fewer than 2,000 active Special Agents) had recommended 5,203 cases for prosecution. This yields an average of 5.0 cases per agent per year. For comparison, the FBI (with slightly more than 13,000 active Special Agents) had recommended 8,819 cases for prosecution, for an average of 1.2 cases per agent per year. ATF, as a bureau, consists of several different groups that each have their own respective role, commanded by a director. Special Agents are empowered to conduct criminal investigations, defend the United States against international and domestic terrorism, and work with state and local police officers to reduce violent crime on a national level. ATF Special Agents have some of the broadest authority of any federal agency; 18 U.S.C. § 3051 empowers them to enforce any statute in the United States Code. Specifically, ATF Special Agents have lead investigative authority on any federal crime committed with a firearm or explosive, as well as investigative authority over regulatory referrals and cigarette smuggling. ATF Special Agents also often enforce violations of the Uniform Controlled Substances Act, and have the statutory authority to conduct narcotics cases independently of the Drug Enforcement Administration, Homeland Security Investigations, or any other agency. All ATF Special Agents require a Top Secret (TS) security clearance, and in many instances, need a higher level, TS/SCI (Top Secret/Sensitive Compartmented Information) clearance. In order to get a security clearance, all potential ATF Special Agents must pass a detailed series of Single Scope Background Investigations (SSBI). ATF Special Agents consistently rank at the top or near the top of all federal agencies in cases referred for prosecution, arrests made, and average time per defendant on an annual basis. Special Agents currently comprise around 2,400 of the Agency's approximately 5,000 personnel. The remainder of the bureau is personnel in various staff and support roles from office administrative assistants to intelligence analysts, forensic scientists, legal counsel, and technical specialists. Additionally, ATF relies heavily on state and local task force officers to supplement the Special Agents and who are not officially part of the ATF roster. Basic special agent training for new hires consists of a two-part training program. The first part is the Criminal Investigators Training Program (CITP) delivered by the Federal Law Enforcement Training Center (FLETC), Department of Homeland Security, Glynco, Georgia. The CITP provides fundamental training in the techniques, concepts and methodologies of conducting criminal investigations. Some of the subjects covered in the training include training in firearms, physical techniques, driving techniques, handcuffing, interviewing, surveillance, crime scene management, photography, basic firearms training and federal court procedures. The CITP lasts approximately 12 weeks. Each class consists of 48 students, of whom approximately half are ATF trainees. The remaining portion of the CITP class consists of students from other federal agencies. The second part of training is the Special Agent Basic Training (SABT). SABT for special agent trainees is a demanding and intensive training program that covers a wide range of disciplines including firearms and ammunition identification; firearms trafficking; report writing, interviewing techniques; alcohol/tobacco diversion investigations; explosives and fire/arson investigations; firearms and tactical training, close quarter countermeasures; field operations, undercover techniques; and physical conditioning. The SABT consists of approximately 15 weeks of training with a class of 24 student trainees. Industry Operations Investigator Basic Training (IOIBT) is a comprehensive 10-week program designed to train newly hired industry operations investigators (IOI) in the basic knowledge, skills, and abilities they need to effectively conduct inspections of firearms and explosives licensees and permittees, as well as provide assistance to other Federal, State, and local law enforcement agencies. Successful completion of IOIBT is mandatory in order for the newly hired IOI to maintain their employment. Members of ATF special agent ranks are issued the Glock 22 or the Glock 27 as their primary duty weapon and are trained in the use of, and issued, certain long arms. The ATF Special Response Team (SRT) is armed with Colt M4 assault rifles and other firearms. The ATF has several field offices across the nation in major cities. Those cities are: Atlanta; Baltimore; Boston; Charlotte, North Carolina; Chicago; Columbus, Ohio; Dallas; Denver; Detroit; Houston; Kansas City, Missouri; Los Angeles; Louisville, Kentucky; Miami; Nashville, Tennessee; New Orleans; New York City; Newark, New Jersey; Philadelphia; Phoenix, Arizona; San Francisco; Seattle; St. Paul, Minnesota; Tampa, Florida; and Washington, D.C. Also there are field offices in different countries such as Canada, Mexico, El Salvador, Colombia, Iraq, and in the Caribbean. ATF is responsible for regulating firearm commerce in the United States. The bureau issues Federal Firearms Licenses (FFL) to sellers, and conducts firearms licensee inspections. The bureau is also involved in programs aimed at reducing gun violence in the United States, by targeting and arresting violent offenders who unlawfully possess firearms. ATF was also involved with the Youth Crime Gun Interdiction Initiative, which expanded tracing of firearms recovered by law enforcement, and the ongoing Comprehensive Crime Gun Tracing Initiative. ATF also provides support to state and local investigators, through the National Integrated Ballistic Identification Network (NIBIN) program. ATF provides investigative support to its partners through the National Integrated Ballistic Information Network (NIBIN), which allows federal, state, and local law enforcement agencies to image and compare crime gun evidence. NIBIN currently has 203 sites. In FY07, NIBIN's 174 partner agencies imaged more than 183,000 bullets and casings into the database, resulting in over 5,200 matches that provided investigative leads. With the passage of the Organized Crime Control Act (OCCA) in 1970, ATF took over the regulation of explosives in the United States, as well as prosecution of persons engaged in criminal acts involving explosives. One of the most notable investigations successfully conducted by ATF agents was the tracing of the vehicle used in the World Trade Center 1993 bombings, which led to the arrest of persons involved in the conspiracy. ATF also enforces provisions of the Safe Explosives Act, passed after 9/11 to restrict the use/possession of explosives without a federal license to use them. ATF is considered to be the leading federal agency in most bombings that occur within the U.S., with exception to bombings related to international terrorism (investigated by the FBI). ATF currently trains the U.S. military in evidence recovery procedures after a bombing. All ATF Agents are trained in post-blast investigation, however ATF maintains a cadre of approximately 150 highly trained explosive experts known as Certified Explosives Specialists (CES). ATF/CES Agents are trained as experts regarding Improvised Explosive Devices (IED's), as well as commercial explosives. ATF Agents work closely with state and local Bomb Disposal Units (bomb squads) within the United States. In 2006, the National Rifle Association (NRA) lobbied U.S. Representative F. James Sensenbrenner to add a provision to the Patriot Act reauthorization that requires Senate confirmation of ATF director nominees. (Prior to that, ATF directors were simply appointed by the administration.) After that, the NRA lobbied against and effectively blocked every presidential nominee, leaving the agency in the hands of acting directors for seven years. In 2007, Bush nominated Mike Sullivan for the position, a U.S. Attorney from Boston with a good reputation, but Republican Sens. Larry Craig and Michael D. Crapo, both from Idaho, blocked his confirmation after complaints from an Idaho gun dealer. In 2010, President Barack Obama nominated Andrew Traver, head of the ATF's Denver division, to fill the top spot, but the Senate never held his confirmation hearings. The NRA strongly opposed Traver's nomination. Ultimately B. Todd Jones was nominated by Obama and confirmed by the Senate as permanent ATF director on July 31, 2013. ^ "History of ATF". Bureau of Alcohol, Tobacco, Firearms and Explosives. 2009. Retrieved May 2, 2009. ^ a b "Fact Sheet (FY 2012)". ATF.gov. May 2013. Archived from the original on September 22, 2013. Retrieved September 25, 2013. ^ "Congressional Budget Submission Fiscal Year 2017". U.S. Department of Justice. February 2016. Retrieved May 12, 2018. ^ "ATF Online – Bureau of Alcohol, Tobacco and Firearms". Atf.gov. Retrieved June 17, 2012. ^ "Deputy Director". Atf.gov. Retrieved June 17, 2012. ^ "Bureau of Alcohol, Tobacco, Firearms, and Explosives (ATF)" (PDF). U.S. Department of Justice. Retrieved January 18, 2013. ^ "History of ATF from Oxford University Press, Inc. – 1789–1998 U.S". Atf.gov. Archived from the original on July 28, 2012. Retrieved June 17, 2012. ^ As early as the year 1918, however, the Bureau of Internal Revenue had begun using the name "Internal Revenue Service" on at least one tax form. See Form 1040, Individual Income Tax Return for year 1918, as republished in historical documents section of Publication 1796 (Rev. Feb. 2007), Internal Revenue Service, U.S. Department of the Treasury. Form 1040s for years 1918, 1919, and 1920 bore the name "Internal Revenue Service". For the tax years 1921 through 1928, the name was dropped, then was re-added for the 1929 tax year. ^ a b Holley, Joe (January 11, 2008). "Rex Davis, 83; ATF Ex-Chief, Moonshiners' Foe". Washington Post. p. B07. Retrieved May 4, 2009. ^ Ruby Ridge: Report of the Senate Subcommittee on Terrorism, Technology and Government Information, 1995. "It was later established that these rumors were unfounded." ^ "D.O.J. Office of Professional Responsibility Ruby Ridge Task Force Report" (PDF). U.S. Department of Justice. June 10, 1994. Archived from the original (PDF) on April 21, 2009. Retrieved April 30, 2009. ^ "The Bureau of Alcohol, Tobacco, Firearms, and Explosives". The Free Dictionary. 2005. Retrieved February 6, 2011. ^ See "McVeigh Remorseless About Bombing," newswire release, Associated Press, 2001-03-29, reposted at Cult Education Institute, accessed July 4, 2015. ^ SHUSTER, BETH; RICCARDI, NICHOLAS (December 19, 2001). "Antonovich Is Critical of ATF Over Shootout" – via LA Times. ^ "Local ATF agent Jeff Ryan was haunted by LA shooting, plagued by PTSD, before taking his life". ^ Westerfield, Mike (2014). Make: Rockets: Down-to-Earth Rocket Science. Maker Media. p. 58. ISBN 978-1-4571-8631-8. ^ Brown, Patricia Leigh (October 14, 2006). "A Cult of Backyard Rocketeers Keeps the Solid Fuel Burning". New York Times. ^ Sullivan, Jack (March 6, 2003). "Hobbyists Complain About New ATF Rules". ^ Ross, Brian; RICHARD ESPOSITO; JOSEPH RHEE (May 2008). "ATF: Phoenix Gun Dealer Supplied Mexican Drug Cartels". ABC News. ABC News. Retrieved February 14, 2011. ^ U.S. DOJ (November 2010). "Review of ATF's Project Gunrunner" (PDF). U.S. Department of Justice Office of the Inspector General Evaluation and Inspections Division. U.S. Department of Justice Office of the Inspector General Evaluation and Inspections Division. Retrieved January 29, 2012. ^ "US.v.Avila Indictment" (PDF). U.S. Department of Justice. U.S. Department of Justice. 2011. Archived from the original (PDF) on February 6, 2011. Retrieved February 14, 2011. ^ "US_v_Flores_Indictment" (PDF). U.S. Department of Justice. U.S. Department of Justice. 2011. Archived from the original (PDF) on February 20, 2011. Retrieved February 14, 2011. ^ "US.v.Broome Indictment" (PDF). U.S. Department of Justice. U.S. Department of Justice. 2011. Archived from the original (PDF) on February 20, 2011. Retrieved February 14, 2011. ^ "US.v.Aguilar Indictment" (PDF). U.S. Department of Justice. U.S. Department of Justice. 2011. Archived from the original (PDF) on February 20, 2011. Retrieved February 14, 2011. ^ "US.v.Abarca Indictment" (PDF). U.S. Department of Justice. U.S. Department of Justice. 2011. Archived from the original (PDF) on February 20, 2011. Retrieved February 14, 2011. ^ Gliha, Lori (July 1, 2011). "Weapons linked to controversial ATF strategy found in Valley crimes". KNXV-TV, ABC15.com. KNXV-TV, ABC15.com. Archived from the original on July 3, 2011. Retrieved July 1, 2011. ^ "Fast and Furious Investigation" (PDF). BATFE. U.S. Department of Justice. 2011. Retrieved February 14, 2011. ^ Serrano, Richard (August 16, 2011). "ATF promotes supervisors in controversial gun operation". The Los Angeles Times. The Los Angeles Times. Retrieved August 21, 2011. ^ Serrano, Richard (August 17, 2011). "ATF denies it promoted Fast and Furious supervisors". The Los Angeles Times. The Los Angeles Times. Retrieved August 21, 2011. ^ O'Reilly, Bill (June 30, 2011). "ATF Whistleblower Speaks Out About Botched Gun Operation". Fox News. Fox News. Retrieved July 1, 2011. ^ Lott, Maxim (June 27, 2011). "'Project Gunrunner' Whistleblower Says ATF Sent Him Termination Notice". Fox News. Fox News. Retrieved July 1, 2011. ^ a b c ABC News. "ATF Director B. Todd Jones Stepping Down After Nearly 4 Years on Job". ABC News. ^ "Bureau of Justice Assistance – Re-Direct" (PDF). Ojp.usdoj.gov. Archived from the original (PDF) on March 4, 2012. Retrieved June 17, 2012. ^ "TRAC Detail Reports". Trac.syr.edu. Retrieved June 17, 2012. ^ "Prison sentences which initially rose have now fallen". Transactional Records Access Clearinghouse. Syracuse University. Retrieved May 18, 2009. ^ a b "Special Agent Training". Bureau of Alcohol, Tobacco, Firearms and Explosives. Retrieved May 17, 2017. This article incorporates text from this source, which is in the public domain. ^ "Industry Operations Investigator Training | Bureau of Alcohol, Tobacco, Firearms and Explosives". www.atf.gov. Retrieved September 20, 2018. ^ "Organization Structure | Bureau of Alcohol, Tobacco, Firearms and Explosives". ATF. Retrieved October 8, 2016. ^ "ATF Field Divisions". Bureau of Alcohol, Tobacco, Firearms and Explosives. Retrieved December 26, 2018. ^ "ATF Snapshot (2006)". Bureau of Alcohol, Tobacco, Firearms, and Explosives. Archived from the original on December 3, 2009. ^ a b "ATF Snapshot (2008)". Bureau of Alcohol, Tobacco, Firearms, and Explosives. Archived from the original on November 10, 2010. ^ a b c Horwitz, Sari (July 31, 2013). "Senate confirms ATF director". Washington Post. Retrieved June 25, 2014. ^ Yager, Jordy (June 18, 2013). "Sen. Durbin pressures gun lobby with threat to move ATF authority to FBI". The Hill. Capitol Hill Publishing. Retrieved June 25, 2014. ^ Serrano, Richard A. (July 11, 2013). "ATF nominee faces obstacles to confirmation". Los Angeles Times. Retrieved June 25, 2014. ^ Puschak, Evan (December 26, 2012). "ATF Handicapped by Laws and a Lack of Leader". NBC Universal. Retrieved January 7, 2013. ^ Lavoie, Denise (October 13, 2008). "ATF Director's Confirmation Blocked by GOP". USA Today. Associated Press. Retrieved January 7, 2013. ^ Skiba, Katherine (February 16, 2011). "Gun Lobby Stands Firm in Opposing Obama's ATF Nominee: Chicago Gang Fighter Called Wrong Choice To Head Agency". Chicago Tribune. Retrieved January 7, 2012. ^ "United States Government". World Statesmen.org. Ben Cahoon. Retrieved April 30, 2009. This page was last edited on 16 April 2019, at 20:36 (UTC).